Xinshu (Grace) Xiao and David Wong in Dr. Wong’s laboratory. 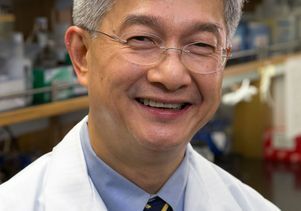 “If we can define the boundaries of molecular targets in saliva, then we can ask what the constituents in saliva are that can mark someone who has pre-diabetes or the early stages of oral cancer or pancreatic cancer — and we can utilize this knowledge for personalized medicine,” said Dr. David Wong, a senior author of the research and UCLA’s Felix and Mildred Yip Endowed Professor in Dentistry. RNA, widely known as a cellular messenger that makes proteins and carries out DNA’s instructions to other parts of the cell, is now understood to perform sophisticated chemical reactions and is believed to perform an extraordinary number of other functions, at least some of which are unknown. The new research is a collaboration with Xinshu (Grace) Xiao, the paper’s other senior author and a UCLA associate professor of integrative biology and physiology in the UCLA College. Using state-of-the-science genomics and bioinformatics, the researchers analyzed 165 million genetic sequences. Among the many forms of RNA are some unusual ones that live in the mouth and in cells. For example, it wasn’t known until very recently that RNA comes in a circular form; the linear form has long been known. 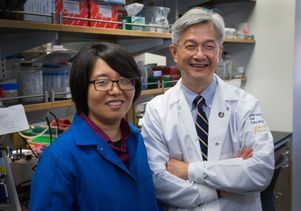 But the UCLA scientists identified more than 400 circular RNAs in human saliva — the first discovery of circular RNA in saliva or any body fluid — including 327 forms that were previously unknown. Circular RNA’s function in saliva is not entirely understood, although it does serve as a sponge for tiny RNA molecules called microRNAs, which bind to it. 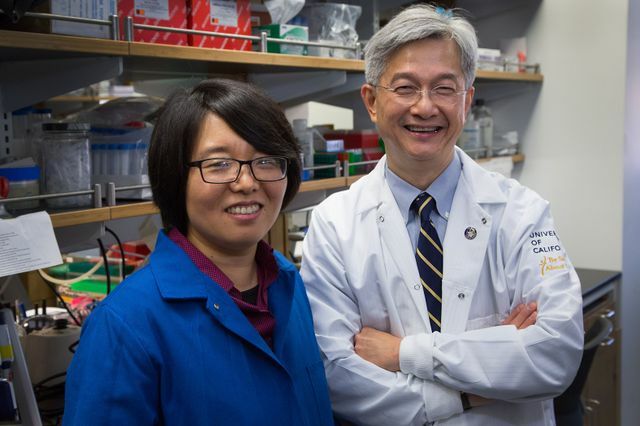 “Circular RNAs in saliva may be protecting other RNAs,” said Xiao, who also is a member of UCLA’s Molecular Biology Institute. It’s likely, she said, that circular RNAs in saliva protect microRNAs from being degraded. 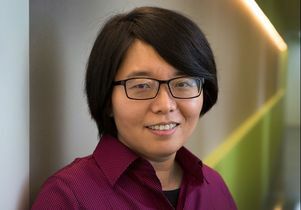 MicroRNAs, which once seemed to be little more than molecular noise, play important roles in many cell types, and have been implicated in cancers and other diseases, Xiao said. One microRNA can regulate hundreds of genes, she said. The scientists compared microRNA levels in saliva to those in the blood and other body fluids, and found the levels of microRNA in blood and in saliva are very similar — indicating that a saliva sample would be a good measure of microRNAs in the body. They also found that saliva contains another class of small RNAs, called piwi-interacting RNAs, or piRNAs, which are produced by stem cells, skin cells and germ cells. There are very few piRNAs in blood and most other body fluids, but Xiao’s analysis showed that piRNA are abundant in saliva. Although their function is not yet known, Xiao said they may protect the body from viral infection. While most RNA molecules translate genetic code from DNA to make proteins, there is also a class called non-coding RNAs that does not. 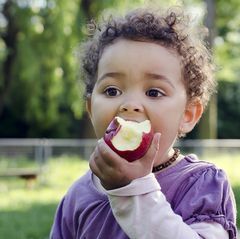 Their overriding conclusion is that saliva has tremendous medical and scientific value. In the not-too-distant future, dentists might be able to take saliva samples to analyze for a variety of diseases. And, Wong says, the research could lead to a new category of self-diagnostic devices. “This could indicate that wearable gear that informs you whether you have a disease — even before you have any symptoms — is almost here,” he said. 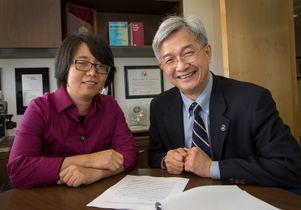 The scientists, both members of UCLA’s Jonsson Comprehensive Cancer Center, will continue their research, aiming to better understand the biology behind their findings, including the function of piRNAs. Co-authors of the research were UCLA postdoctoral scholars Jae Hoon Bahn and Qing Zhang in Xiao’s laboratory; Feng Li, an assistant researcher in Wong’s laboratory; Tak-Ming Chan, a former postdoctoral scholar in Xiao’s laboratory; Xianzhi Lin, a postdoctoral scholar in Xiao’s laboratory; and Yong Kim, a UCLA adjunct associate professor of dentistry. The research was supported by the NIH’s National Center for Advancing Translational Sciences (award UH2TR000923) through the Extracellular RNA Communication program. Wong is co-founder of RNAmeTRIX Inc., a molecular diagnostic company. He holds equity in RNAmeTRIX and serves as a company director and scientific advisor. The University of California also holds equity in RNAmeTRIX. Intellectual property that David Wong invented and which was patented by the University of California has been licensed to RNAmeTRIX. Wong also is a consultant to GlaxoSmithKline, PeriRx, Wrigley and Colgate-Palmolive. Xinshu (Grace) Xiao is a UCLA professor of integrative biology and physiology in the UCLA College.